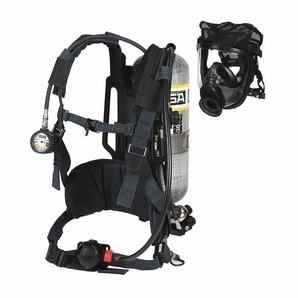 MSA Airhawk II Industrial Self Contained Breathing Apparatus are lightweight, durable and economical. The Industrial Airhawk II SCBA keeps contaminants at bay. The Airhawk II systems is ideal for a variety of industrial-hazard applications. The Airhawwk II offers a variety of options for each of the system's six major components including: face piece, carrier and harness assembly; cylinder; first-stage regulator; mask-mounted regulator; and end-of-service time indicator.